Pra Sivali ancient cast brazen statuette in Nuea Tong Pasom Sacred Brass, from the year 2495 BE, from one of the Great Guru Masters of the World War II and Indo-China Wartime Era, Luang Por Chaeng (2428 - 2500 BE), of Wat Bang Pang. 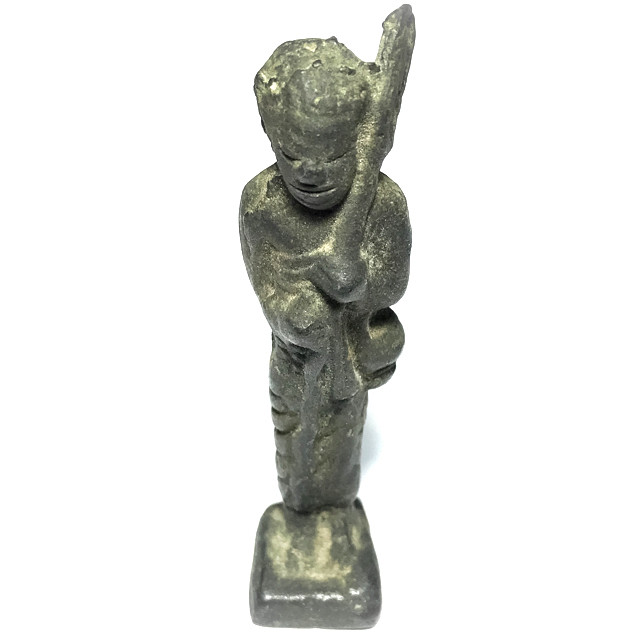 The statuette measures 3 Inches High, and is intended as a Mini Bucha Statue for placement on the altar, dashboard of vehicle, or in the place of business, but is still within the size possible to encase and wear as a large amulet if preferred. Pra Sīvali (Thai: พระสีวลี - Chinese: 尸婆羅) is an Arahant widely venerated among Theravada Buddhists. He is the guardian saint of travel and is believed to ward off misfortunes at home such as fire or theft.His veneration predates the introduction of Theravada Buddhism into Burma. Sīvali is typically depicted standing upright and carrying a walking staff, an alms bowl and Buddhist prayer beads. Born to Queen Suppavasa, Sīvali is believed to have remained in his mother's womb for seven years because of past karma. 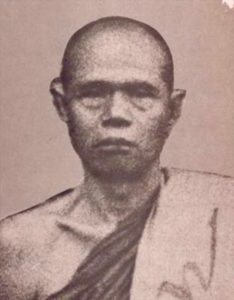 Luang Por Chaeng had a great respect for Luang Por Parn of Wat Bang Nom Kho, and had received a lot of influence from him in the art of amulet making. So when he would make his amulets, he would often make models which resembled and paid reverence to the famous Pra Pim Pra Putta Jao Pratap Sadtw Buddha riding Animals amulets. He made original designs which resembled those of Wat Bang Nom Kho, with differences in design to distinguish them. This caused his amulets to become very popular, as this was the preferred type of amulet at the time in Central Thailand.Luang Por Chaeng made a large number of different amulets, ranging from the Buddha riding animals, and other sacred powder amulets in many forms, in small (Pim Lek), medium (Pim Klang) and large (Pim Yai), Monk Coins, the world famous Pha Yant Tong Yantra Flags, Sai Sek blessed sandgrains, the highly preferred and now rare Pra Kring, and Pra Chaiyawat Loi Ongk Statuettes, Pra Prajam Wan (Birthday Buddha amulets), Nang Kwak beckoning lady, Pra Putta Kwak beckoning Buddha, Pra Sam Lia, (triangular amulet), and of course, his famous and extremely popular Pra Sivali metallic Loi Ongk Statuette amulets, which were made in ancient casting methods, in various forms and sizes, for Bucha on the altar as well as for wear as amulets. Luang Por Chaeng made his Pra Sivali amulets in various shapes and sizes, of which you can see two examples in the below picture, large and small, with differing features.